General Manager James Rogers says his cowboys “get on their horses every day.” Translation? On Nevada’s Winecup Gamble, the ways of the West are alive and well. In a storied corner of The Old West, Paul Fireman has instituted one of the greatest turnarounds in the annals of American ranching. It’s surprising how often a ranch is described as unique. Likewise, the term one-of-a-kind opportunity is bandied about much too eagerly. Few are the properties whose singularity is so pronounced that they merit such accolades. Does their size and their carrying capacity truly set them apart? Is there a remarkable historical narrative or geologic aspect worth crowing about? What about the wildlife? There’s many a cow-calf operation whose fortune is bolstered by the renown of its hunting. What if a ranch boasted all of the above and then some? 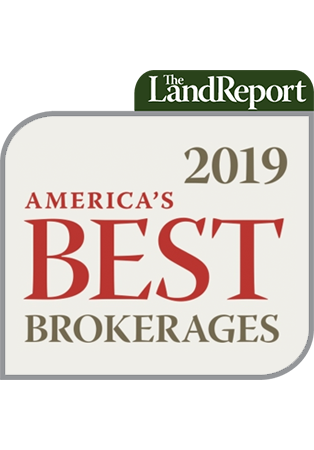 Like a stout P&L, sophisticated management, proven hands, and good neighbors. You know what I’d be inclined to call that outfit? The seeps and springs that water the Winecup Gamble were snapped up by enterprising cowmen more than a century ago. Remember the Forty-Niners? Those intrepid souls journeyed thousands of miles on foot and by ox-drawn wagons in search of a better life. And they did so on the first superhighway to cross the American West. It was called the California Trail, and its many routes were perilous at best. Is there a more haunting chapter in the history of the Old West than the fate of the Donner Party? That was the California Trail at its worst. Compare that with the northeast corner of Nevada where the California Trail muddies the waters of Thousand Springs Creek. That may well be the California Trail at its best. Imagine what it must have been like to spend weeks crisscrossing deserts and choking down dust only to arrive at a camp with hot springs and cold springs. No pampered spa goer at a four-star resort could equal the delight of those pioneers as they soaked their weary bones. Thousand Springs Valley had long been a favorite hunting ground of the Shoshone and early mountain men. By the mid-1800s, this closed basin became the headquarters of a nascent ranching empire. 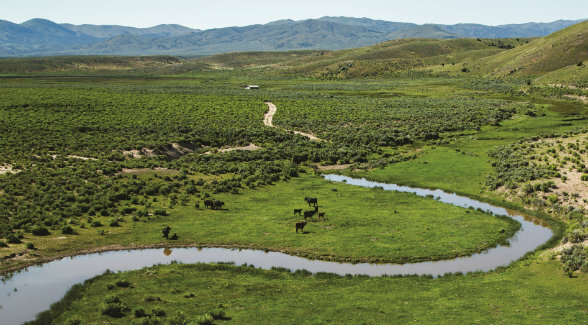 A series of enterprising cattlemen, including future Nevada governor John Sparks, sized up the possibilities in the Thousand Springs Valley and set out to secure water rights however and wherever possible. There was a method to this madness, and it had to do with the enormous amount of public land in Elko County. Grazing cattle on public land can be lucrative. But there’s a catch: Although the land may be public, the water rights can be privately owned. A favorite strategy of early ranchers was to have one of his cowboys file a homestead claim on a strategic tract. Maybe it had a spring or a seep, but as soon as the cowboy took title, he turned around and sold the property to his employer. Over the last 150 years, operators of all ilks ran cattle in the broad valleys and sheep on the hillsides that ring this watertight basin. No precipitation leaves its boundaries. Some, such as a Scot named David Eccles, who purchased the ranch in 1908, were men of vision, true empire builders. An original backer of the Utah Construction Company, the Eccles Company won immense contracts to build the Hoover Dam (1931) and the Alaskan Highway (1942). The bonding requirements on both federal projects were so steep that Utah Construction was forced to pledge its Elko County ranch holdings as collateral. At the time, they totaled an almost unimaginable 3 million acres. But in the decades that followed, there came a series of owners that Salt Lake City broker C. Patrick Bates describes as “lightweights, speculators, and short-term players.” The land suffered and so did the storied reputation of the Winecup Gamble. 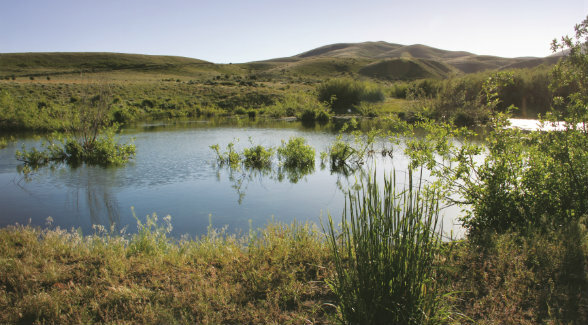 In addition to Thousand Springs Creek, which winds its way some 75 miles through the ranch, the Winecup Gamble is blessed with 8 additional live creeks, 2 reservoirs, 43 ponds, and 49 springs. That changed in 1993 when Paul Fireman assumed the reins of the Winecup Gamble Ranch. Like unique and one-of-a-kind, the term visionary is misapplied all too often. Not in Fireman’s case. In 1979, the Massachusetts native snapped up the US rights to distribute a niche British product. You know the Reebok name now, but you probably didn’t until Fireman came along. He eventually became chairman and CEO of Reebok International. In 2006, he sold Reebok to Adidas for $3.8 billion. That’s what I mean by visionary. In 2009, Fireman looked into his crystal ball and saw another vision: a robust ranch in the heart of Thousand Springs Valley. The time had come to reinvigorate the Winecup Gamble. Fireman’s first step was to engage Clay Worden, a nationally known partner in the agribusiness practice at RSM LLP. Worden brought on board Dykes Everett and Keith Holcomb at Dykes Everett & Company in Orlando to assist with the implementation of the turnaround. Worden’s next step was to convince a Wyoming rancher he had befriended named James Rogers to take over the cattle operation. Some will no doubt attribute the successes of this cadre to luck. I will gladly second that notion as long as luck is defined as follows: when preparation meets opportunity. How big is a million-acre ranch? Think of it this way: After a pasture is grazed, it enjoys an 18-month rest. 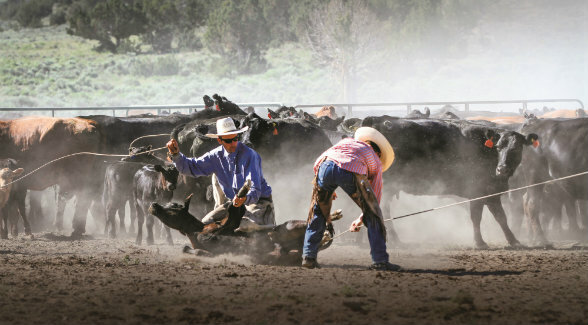 In the years that followed, a disastrous multi-year drought clobbered many cattle producers. So did record corn prices. In short order, the US cattle herd shrank to its smallest size since 1952. Meanwhile, demand stayed robust. The result? A startling run of record beef prices. As profits poured in, Fireman took the long view and plowed them back into his ranch. Over the last seven years, $19 million has been reinvested in livestock, fencing, barns, corrals, employee housing, irrigation, wells, water infrastructure, and more. Ever have a piece of property just the way you want it? Fences high and tight? Roads in good shape? Good neighbors? No leaking roofs? James Rogers knows that feeling. Only his property is 247,500 deeded acres and 558,080 acres of leased federal land. He also has access to another 142,800 acres of unfenced deeded land owned by his neighbors. You see, in Nevada, landowners must fence livestock off of their property. Otherwise, they graze freely. What do you do with a million-acre ranch? The ranch was running an astounding 9,000 head when I visited in June. The astounding part was that I expected to see feedlot-sized concentrations of cattle. Instead, the contrary was the rule: small clusters navigating expansive pastures. Come wintertime, herds can get as large as 3,000 head. Most feature British bloodlines: Red Angus, Black Angus, and Hereford with a “taste of Beefmaster,” says General Manager James Rogers. Rogers convinces me that there are, in fact, three 2,500-head herds, including 5,500 mother cows as well as replacement heifers and stockers. The bull battery numbers 350 head, and 200 older cows are used for seed stock. Three years ago, a grass-fed program was established on almost 1,400 acres of irrigated cropland. That’s optionality. The cattle are “predominantly a British breed influence with a taste of Beefmaster. Mostly Red Angus, Black Angus, and Hereford,” he says. The quality of the forage elicits an enthusiastic response from the cowman. “We have a fabulous variety of grasses; each one is thick and juicy and healthier than the next,” Rogers says. They include Needle-and-Thread, Great Basin wild rye, Russian wild rye, Indian rice, crested wheat, bluebunch wheat, Sandberg blue, and bottlebrush squirrel tail. It also helps that the Winecup Gamble has so many pastures to choose from. Some are as large as 67,000 acres, adds Bates’ associate David Packer. Yet managing a land resource of such size and complexity requires more than just rotational grazing. “Grazing different pastures at different times of the year actually encourages the diversity of grasses. It also prevents cattle from forming bad habits,” Rogers adds. “To me, it’s all about recovery. Giving the land adequate time to get into reproductive status. If you can allow it to do that and don’t come back till it has done that, it will thrive. That’s what you’ll see today,” Rogers says. Acres of wildflowers color the many mountains that rise from a floor of 4,830 feet above sea level to 8,760 feet. “We have an amazing biologist here in Northeast Nevada, Kari Huebner, who manages game for the Nevada Division of Wildlife. Kari comes to the ranch and helps us develop our grazing management plans. You know what that means? We get Wildlife’s input on our plan on the front end,” he adds. 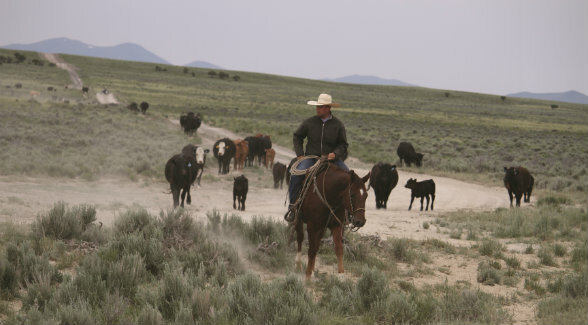 The Winecup Gamble and seven other ranches have banded together to form SANE: Stewardship Alliance of Northeast Elko. 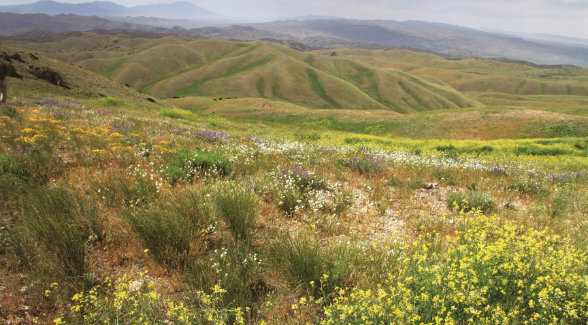 It’s a landowner-driven group that partners with state and federal agencies on landscape-scale habitat projects that are also economically viable for the ranching community. 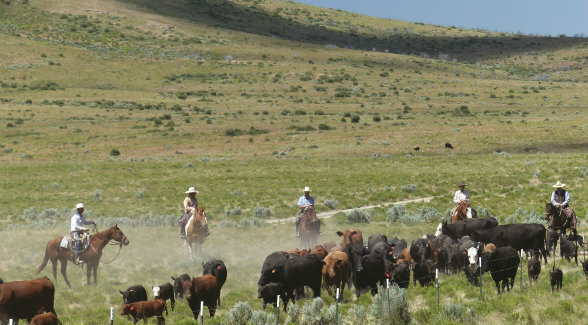 What’s the best way to take a tour of a million-acre ranch? If you’ve got the time, a fortnight in the saddle right after the spring rains would be ideal. An alternative would be to spend a week in a truck trekking from camp to camp, or in the Winecup Gamble’s case, headquarters to headquarters. (There are two.) Given my timeline, a helicopter turned out to be the best option. During our morning aloft, Rogers singled out a range of mountains and referenced it as the ranch’s property line. “Do you mean the one with the grassy slopes?” someone asked. That’s the Winecup Gamble for you. For more information on the historic Winecup Gamble Ranch, which is currently listed for sale at $77 million, lock, stock, and barrel, go to BatesLandCo.com.